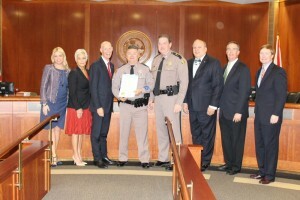 TALLAHASSEE, FL – On December 8, 2015 the Florida Cabinet honored Trooper Bradford Wagner as the Florida Highway Patrol (FHP) 2015 Trooper of the Year. Trooper Wagner is assigned to FHP Troop K in Land O’Lakes, FL. He has been with the Patrol for over 25 years. On September 18, 2014, Trooper Wagner saw and responded to a single vehicle rollover crash where the driver was ejected and came to rest on the roadway, unconscious and not breathing. Through his lifesaving actions, Trooper Wagner was able to get the driver breathing again and maintained care until emergency medical services arrived. On November 27, 2014, while driving on the Suncoast Parkway, Trooper Wagner saw a man standing next to his parked vehicle frantically waving for help. Upon stopping, Trooper Wagner saw the man’s wife unconscious in the front seat of the car. Trooper Wagner acted immediately to free her airway and save her life. The Trooper of the Year award was created in 1965 by the Florida Petroleum Council to recognize Florida Highway Patrol Troopers for the work they do each day to ensure a Safer Florida.